Over the past year, the Tompkins County Planning Department has been developing "The Tompkins County Conservation Plan - Part II: A Strategic Approach to Agricultural Resource Stewardship." 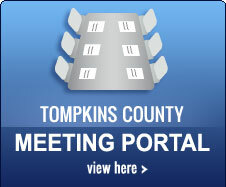 Tompkins County is experiencing intermittent telephone service issues at multiple county facility locations. The County's service provider is working to resolve the current issues; however, there is no definite indication on when this problem will be resolved. With a week to go before Census forms begin to arrive in mailboxes throughout Tompkins County, County officials and community partners gathered this noon to celebrate the 2010 Census and to urge everyone to participate. The community is invited to join in a celebration to formally kick off Tompkins County's 2010 Census campaign Wednesday, March 10, beginning at 12:00 Noon at the Tompkins County Public Library, 101 E. Green Street, Ithaca. The Legislature, by unanimous vote after little discussion, went on record strongly against a retroactive "cost recovery" tax imposed on Industrial Development Agencies (IDAs) across New York State.